The Daasanach (some authors write 'Dassanetch', 'Dasanech', 'Daasanech', or 'Daasanetch') speak an East Cushitic language and live in the semi-arid area around the Lower Omo Valley and the northern shore of Lake Turkana. They have also been referred to as 'Geleb' in Ethiopia and are known as 'Merile' and 'Shangilla' in Kenya. According to the 2007 Ethiopian census, the Daasanach in Ethiopia then numbered just over 48,000. 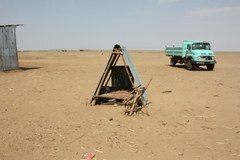 In addition, some thousands of Daasanach live in northwestern Kenya. The main subsistence activities of the Daasanach are pastoralism, flood-retreat cultivation, and fishing. They keep cattle, sheep, goats, donkeys and camels and live a semi-nomadic life. According to the 2000 census of what was then known as the Kuraz wereda (district) - it is now known as Daasanach wereda - they owned 4.4 cattle, 4.9 sheep and 5.2 goats per capita. The Omo River normally floods in July each year. The floodwater brings fertile silts from the Ethiopian highlands and renews the productivity of land for pasture and cultivation. Crops (mainly sorghum) are planted along the banks of the river and in the floodplain as the flood recedes, and harvested in the main dry season. The first harvest comes in December and the second in February. A study of one household in 2003 showed that home-produced sorghum made up about 68.8 per cent of the household's meals in May and about 38.1% in August, which is a hard dry season. Average rainfall recorded at Omerate, the capital of Daasanach wereda, between 1996 and 2000, was only 363 mm. Nevertheless, the annual flood enables the Daasanach to produce abundant and reliable crops, compared to neighbouring pastoral groups. Fishing has traditionally been despised by the Daasanach as a subsistence activity fit only for the poor, who have no livestock, but it has recently become a valued source of cash-income. The basic unit of production and consumption is a household (bil), consisting of a married man, his wife and their unmarried children. When a man marries a second wife, she builds a new house for herself and the husband moves between his wives' houses every other day or every two days. He distributes livestock and arable land to his wives and each wife milks her own livestock, cultivates her land, stores crops, and cooks and eats meals separately with her children. The Daasanach are made up of eight roughly co-residential territorial groups (en) which conduct many rituals together. The Inkabelo, the largest of these groups, live at the centre of Daasanachland, on both sides of the Omo and its delta, along with three smaller groups, the Oro, the Kuoro and the Riele. The Randal and the Elele live in the northwestern part of Daasanachland. 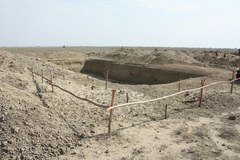 The Inkoria live on the northeastern shore of Lake Turkana, on the Kenyan side of the border. The Ngaritch are located to the north of the Inkoria. According to oral tradition, many of these groups are the descendants of migrants who came to the Omo from various directions to escape such problems as famine and conflict and who thereby constructed 'Daasanach' society. For example, the Inkabelo and the Inkoria (together known as Shiir) lived at a place called Ger or Gerio, probably around the Kerio River on the southwestern side of Lake Turkana, along with the Nyube, or Pokot. When the Turkana (some elders told me the attackers were the Kuoro) attacked them in the early 19th century, the Nyube escaped southward to present Pokotland while the Inkabelo and Inkoria escaped northward, to present Daasanachland. The Randal and the Kuoro originated from the Rendille and the Samburu of northwestern Kenya. They moved to Daasanachland because of natural disasters in the last two decade of the 19th century. Amongst the Daasanach, patrilineal clans (tuuro) or other kin groups do not function as co-resident groups. Although there is no fixed residential pattern for a village, it often consists of influential older men and their cognates, affines, age-mates, and friends. On the eastern side of the Omo there are generally between five and thirty houses per village while on the western side, where people are afraid of attack from neighbouring groups, there are generally more than fifty. The distance between villages on both sides of the river is more than several hundred metres. All Daasanach men belong to a generation-set (haari). A man joins his set between the ages of fifteen and twenty through an initiation ceremony, after which he moves from the status of boy (nyigeny) to adolescent (kabana). After initiation men are able to marry and most are married before they are thirty. Girls marry between the ages of fifteen and twenty. When a couple's first daughter reaches the age of approximately ten years they go through a ceremony known as dimi, after which they are recognized as social elders (karsich). Six ethnic groups live around the Daasanach. The Kara, to the north, and the Arbore, to the northeast, are classified as "our people" (gaal kinnyo) and have friendly relations with the Daasanach. The Turkana, to the southwest, the Nyangatom, to the northwest, the Hamar, to the northeast, and the Gabra, to the southeast, all of whom depend mainly on pastoralism, are classified as "enemies" (kiz) and have fought with the Daasanach intermittently for many years. The Daasanach were incorporated into the Ethiopian empire at the end of 19th century. Since then, the Ethiopian and Kenyan governments have had a negative impact on their survival and their relations with other groups in the following ways. First, arbitrarily formed international and domestic borders have disturbed their migration routes and discouraged trans-ethnic mutual visiting. Second, Ethiopian administrators (from the 1900s to the 1930s) and Italian administrators (from 1936 to 1941) organized the Daasanach into raiding parties or border security forces against the British East African Protectorate, so that Daasanach were encouraged or even compelled to fight against Kenyan pastoralists, such as the Turkana and Gabra. Third, rifles were introduced to the area by Ethiopian traders in the early 20th century and the intensity of violence has increased since then. In addition, the proliferation of automatic rifles caused by political upheavals in Uganda, Sudan, Somalia, and Ethiopia has worsened the situation since the late 1970s. It should be emphasized that, despite these negative influences, the pastoralists of the region have maintained amicable trans-ethnic friendship and kinship relations, which have helped them restore peace after outbreaks of violence. Uri Almagor, who conducted anthropological fieldwork amongst the Daasanach in 1968 and 1969, described the Lower Omo Valley as one of the most inaccessible areas in East Africa. This was no longer the case by the turn of the 20th century. The area is now in the front line of investment by international and state corporations. Three large-scale development projects are in progress. First there is the construction of the Gibe III hydroelectric dam in the middle basin of the Omo. This will regulate the flow of the river and reduce the scale and frequency of flooding, which is the lifeblood of the Daasanach economy. Second, the government has leased huge areas of land to foreign and domestic investors who plan to establish large-scale commercial farms, largely for the production of export crops. 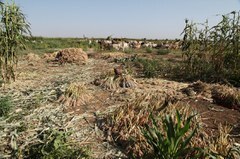 Italian (since 2007), Indian (since 2013) and Tigrayan (since 2009) owned farms have started to operate in Daasanach territory and many people have been displaced from their land without compensation, although some elders received a few thousands birr from local administrators and investors as a 'gift'. Conflicts have arisen between workers on the commercial farms and the Daasanach living around the farm. And third, oil exploration by Tullow Oil PLC began in 2013. In addition, the local government plans to sedentalize about 2,600 Daasanach households. Daasanach responses to these projects vary according to a person's generation, gender, place of residence and economic status. Generally speaking, those living in the district (wereda) capital (Omerate) and who have graduated from secondary or high school, expect these projects to provide them with good opportunities for employment. On the other hand, other Daasanach - around 97 per cent of the population - complain bitterly about current developments and express anxiety about the future. This applies especially to young men with responsibility for the welfare of livestock, some of whom insist that 'we are people of livestock (gaal aaniet) and do not need Highlander's farms which make livestock herding impossible'. A few young men, who own little or no livestock, have been employed on commercial farms. They often complain about their low wages and the bad behaviour of Highland workers, but not about the existence of the farms themselves. Some elders in the village have been treated as community leaders by the local administration and set up as proponents of projects. When the investors and local administration started to found commercial farms, they gave small amounts of money to some elders and made them bless investors in public meetings in order to persuade other Daasanach to give away their land to investors. As a result, tensions have run high between the younger generation and the elders. More observation and analysis is needed of the way the government is attempting to reconcile 'democratic developmentalism' with local interests. Sagawa, Toru 2010 War experiences and self-determination of the Daasanach in the conflict-ridden area of northeastern Africa. Nilo-Ethiopian Studies 14: 19-37. Sagawa, Toru 2006 Wives' domestic and political activities at home: The space of coffee drinking among the Daasanetch of southwestern Ethiopia. African Study Monographs 27-2: 63-86.